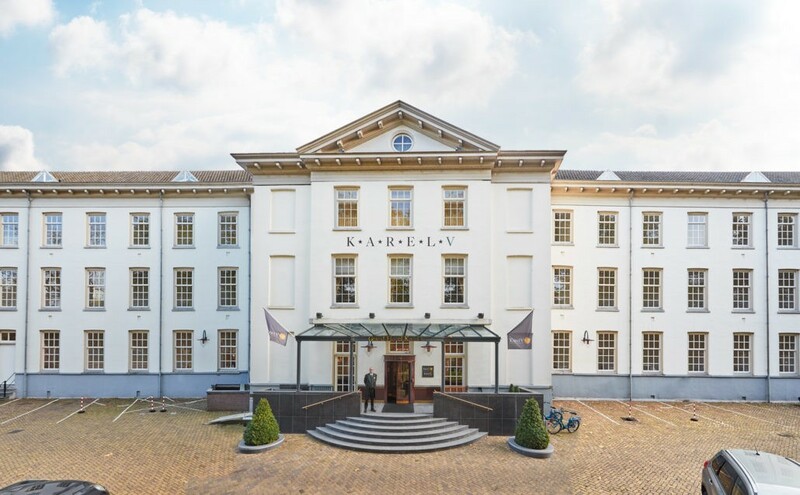 GLOBAL HOSPITALITY SERVICES PARTNER WITH GRAND HOTEL KAREL V, A PROPERTY WITH UNIQUE HISTORY AND ARCHITECTURE. GHS delights in welcoming Grand Hotel Karel V, a 14th century monastery in the heart of Utrecht, The Netherlands and introduces a new location to the GHS global map. Utrecht owns a vibrant and inspiring atmosphere and is one of the hidden jewels of the Netherlands. One of the greenest cities in Europe and located a stone’s throw away from its capital, Utrecht holds the perfect mix of modern concepts and historical buildings. Among those astonishing ancient constructions, lies Grand Hotel Karel V.
Grand Hotel Karel V was once home to medieval knights, priests and emperors, but today, it is one of the city’s most surprising hideaways. Throughout the hotel, traces of the past can be found in archaeological finding, exhibitions, archival photographs and historical drawings. In 2007, the garden wing was restored and renamed Roman wing after archaeologists came across the remnants of a Roman burial ground from the period 40 BC – 227 AD. This independent, 5-star hotel, is warm, inviting, hosts a lively atmosphere and boasts 121 luxurious guest rooms, thirteen meeting spaces and two restaurants, but the icing of the cake is its extraordinary 10,000 m2 garden. Beside all the history surrounding the hotel, Grand Karel V offers second to none services and technology complemented by the gastronomic paradise offered in its restaurant and bistro. GHS is proud to include this majestic property with centuries of history into their global portfolio of over 180 Hotel Partners across 100 destinations worldwide. Global Hospitality Services will work as an extension of Grand Karel V sales and marketing teams, opening them up to the global market and giving them access to a multitude of exclusive benefits such as: international travel programmes, key industry contacts, transcendent sales expertise, global brand awareness and much more. Leo Hollman, General Manager at Hotel Karel V commented: “We are delighted for this new partnership with GHS Global Hospitality. We look forward to GHS opening up Grand Karel V into the global market and enhance our hotel sales and marketing opportunities”. GHS comes with the support of an international team spread in multiple offices across Europe, Asia and the Americas. GHS’ global team keeps expanding to deliver the best practices to each and every one of their Hotel Partners in every corner of the globe and continues to offer the ideal mix of exceptional service and unrivalled knowledge. GHS looks forward to a productive and fruitful relationship with Grand Hotel Karel V and is enthusiastic about the development of this partnership. Founded in 2008, Global Hospitality Services is a professional hotel sales and marketing company, launched by hotel sales experts to fulfil the growing needs of independent hotels for personalized and innovative hotel sales, marketing, and distribution activities in the increasingly competitive global marketplace. Focused on individual hotel needs but leveraging unrivalled industry expertise and global reach, GHS assists Hotel Partners to enhance their brand and drive sales. With over 50 international personnel working as an extension of a hotel’s sales team, GHS covers over 30 global key countries and represents over 180 independent hotels worldwide. The global sales and marketing team specialises in corporate, MICE, and leisure sales, targeting relevant business for each Hotel Partner across the globe. Partner Hotels include Emaar Hospitality Group in Dubai, H-Hotels in Germany and Switzerland and Pestana Hotel Group in the Americas and London, amongst others.